Built in the 18th century (1715-1738) at the initiative and with the support of Habsburg authorities, the bastionary citadel of Alba Iulia became the strongest fortification within a complex defense system against Turks and a consolidation point of the dominant over the conquered territories. Placed on the location of older fortifications (the Roman castrum of the 13th Gemina Legion and a rectangular plan medieval fortress), the new fortification will stand out due to its amplitude and the complexity of defense works, the richness and the originality of the plastic decorations adding to the value of this objective. 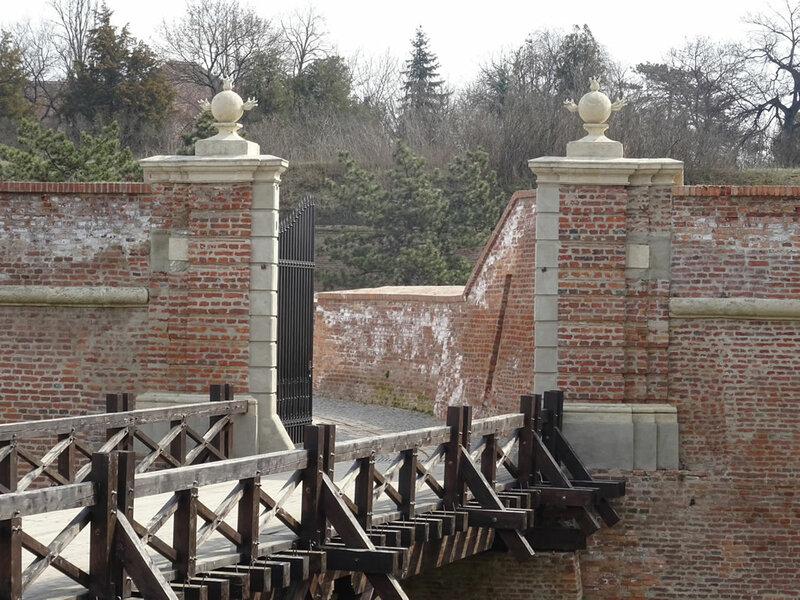 It was built according to a plan elaborated by the Italian architect Giovanni Morando Visconti, in accordance with the newest European principles applied in the construction of fortifications – the Vauban system. 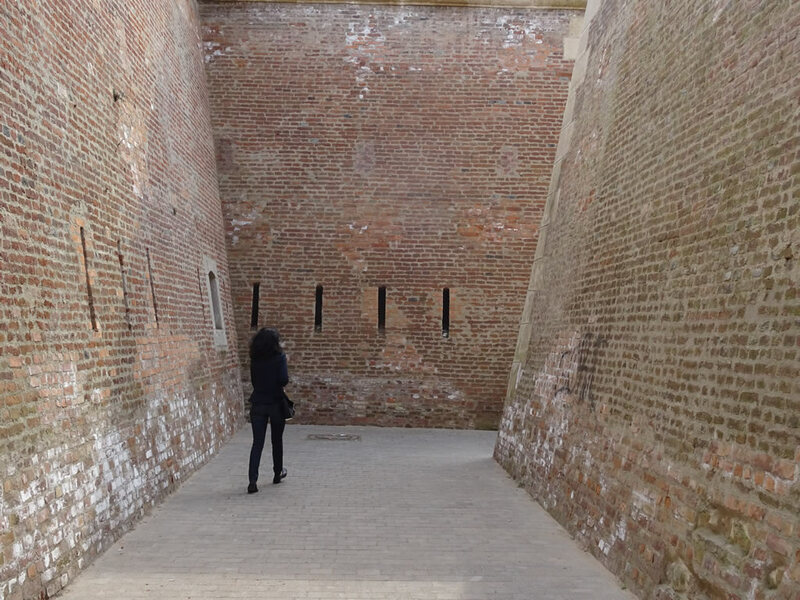 Consequently, the citadel of Alba Iulia adopted the shape of an irregular heptagon, the defense elements being laid successively, in ascending steps, from the inside to the outside. The fortified ensemble includes a precinct defended by three rows of walls, provided with bastions and ravelins, confined by wide and deep ditches, access gates and barracks for sheltering the troops. The volume of works proved to be impressively large, including the building of a terrace and the demolishing of the city and the medieval fortress, the new fortification extending on a surface slightly over 70 ha, the length of all walls summing up to over 12 km. The citadel had its own sewage system, a mill built in the Capistrano bastion, deep water wells for water supply, two powder storage houses, food as well as feed and material storage rooms, repair workshops, services and other facilities necessary for a contingent of approximately 10,000 soldiers in wartime. 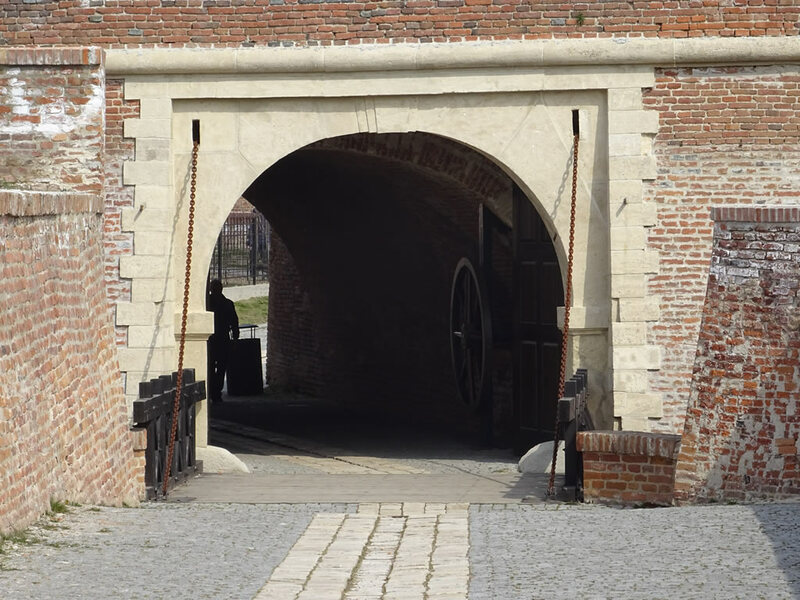 Building the bastionary citadel of Alba Iulia involved huge efforts, both workforce and material resources. Over 20,000 Romanian peasants contributed in this project alongside the authorities and the specialists. The citadel was a continuously open construction site, the elements of the vast military complex being built in stages, without ever succeeding in concluding any of them. Nevertheless, the expenses for the building of the citadel amounted to approximately 2,000,000 gulden. Obsolete because of the new historical realities, including the tactics and strategies characteristic to the modern wars, the citadel of Alba Iulia did not succeed in fulfilling its role as a "bastion" in the anti-Ottoman battle. The only notable events which can be connected to its past are Horea’s uprising (1784-1785) and the Transylvanian Revolution (1848-1849).
. Situated in the Eastern extremity of the ensemble, the gate was built in the shape of a triumphal arch with three openings. 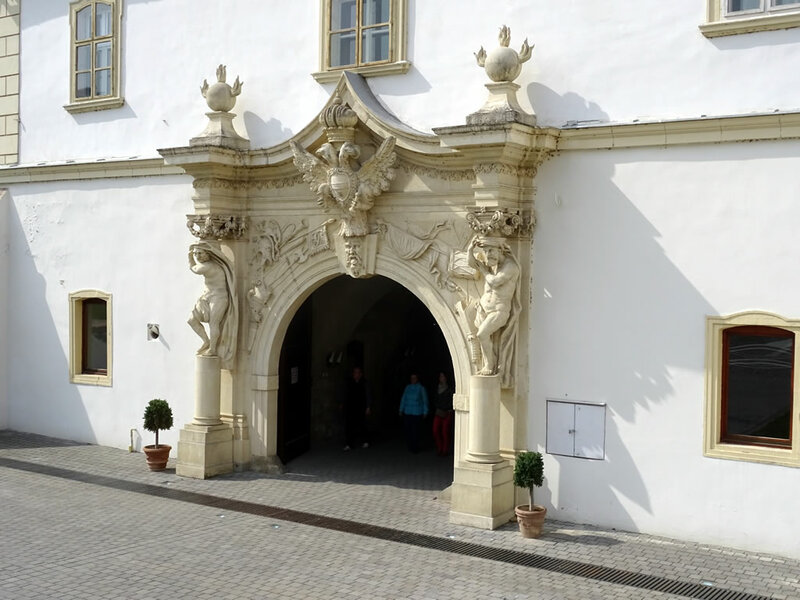 The flanked statues of Venus and Mars are placed over the architrave, framing the coat of arms of the House of Austria. Two bombards in a shooting position are placed at the extremities. The facades are decorated with embossments inspired from the antic mythology: Aeneas saving his father Anchises from the flames of Troy and the fight between Hercules and Antheus at the exterior, Perseus holding Medusa’s head and Hercules fighting the Nemean lion at the interior. 2. 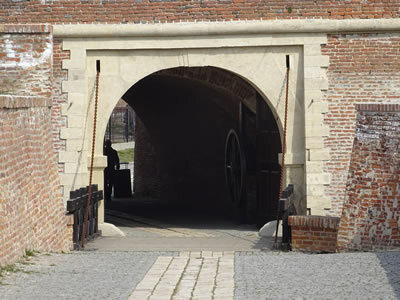 THE SECOND GATE OF THE CITADEL. It is composed of two, square, lateral pillars adorned with flower and leaf garlands in their superior side, being encased in the brick wall following the route crossing the earth berm in front of the main fort ditch; an exploding canon ball is illustrated above them. This gate also has two pillars inside, decorated with two Atlases, a beardless young man and an older, bearded man. They are both bending under the weight they are supporting, their rendering being strong, monumental. The volumes are convincing, the mantle only covering their hips, leaving their strong bodies in sight. The superior part maintains the decorations of the lateral pillars. Two lions throne above the inside pillars.
. Monumental in aspect, the main entry gate into the fort represents the most important sculptural ensemble of the citadel. The prismatic edifice displays rich figurative decorations, anthropomorphic, zoomorphic and vegetal, being composed of war scenes, weapons, flags, trophies, crests and masks. They adorn the entablement and fields, highlighting the volume of the Atlases’ bodies by the flat embossment of the rendering. The four main panels depict the following: outside - the investiture of Eugene of Savoy as army commander, Goddess Victory handing over the citadel mock-up to Eugene of Savoy and inside - the charge of the Christian chivalry and the attack of the Austrian imperial infantry against the Ottoman artillery. All these are inspired by the political and military atmosphere of the era in which the citadel was built. To the East, the gate is crowned by the equestrian statue of Emperor Charles VI. The prison cell were Horea, the leader of the uprising in 1784, was incarcerated is lodged in the foundation of this statue. Inside, the façade is crowned by the symbolic statues of Plenty, Wisdom, Moderation and Fortitude. Situated on the Western wing, the fourth gate is only decorated on the interior façade. 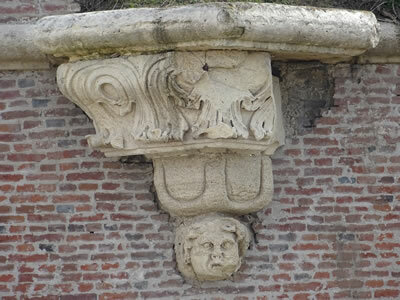 The inspiration source is also mythological and military, reuniting Atlases, weapons, trophies, banners and an image of Fury, these elements of the plastic decorations being common for the entire fortification. 5. THE FIFTH GATE OF THE CITADEL. The fifth gate is not decorated. It has a rough aspect and has the shape of a semi-circular tunnel carved in the brick wall of the fortification. It is located near the fourth gate, to which it is connected by a wooden bridge and a short pedestrian alley. 6. THE SIXTH GATE OF THE CITADEL. 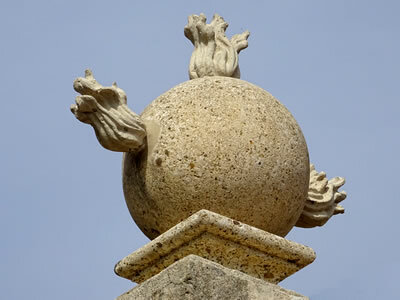 The sixth gate of the citadel is built of two lateral stone pillars, decorated in their superior part with the image of an exploding canon ball. The two-fold cast iron gate is attached to it and creates the access into citadel from the West. The connection with the fifth gate is made through a spectacular, rather narrow passageway, bordered by the stone walls of the citadel. Following a long restoration period, the entire ensemble of gates of the Alba Carolina Citadel is nowadays finalized, being presented to the tourists as an interesting itinerary entitled The Citadel Gates, crossing the fortress from East (Gate I) to West (Gate VI).